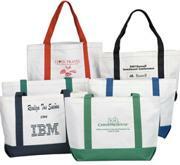 Six types of bulk super economy custom imprinted canvas totes or custom embroidered canvas totes: your choice. 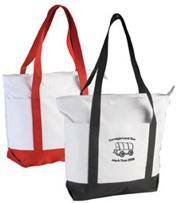 Budget Prices in the USA and Canada for bulk custom imprinted canvas boat totes . American clients pay no taxes, Canadian clients do not pay PST . · All Prices below include 1 color custom imprint. 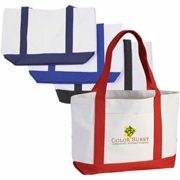 · Additional color/location imprint: add $0.60 each. · Imprint Setup Charge: $45.00 per color/location.
' 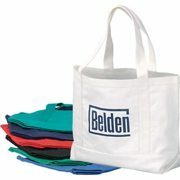 Embroidery : add $1.60 per tote for 5000 stitches, plus $0.32 per tote for each 1000 stitches above 5000. There is no Setup Charge for Embroidery.
' Standard Production: 10 Days; contact us for faster delivery. 600D polyester. Front pocket. Hand & shoulder strap. 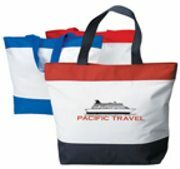 Additional Imprint colors: add $0.55 per color, per location, per boat tote bag. 12 oz canvas. Hand & shoulder strap. 600D polyester. 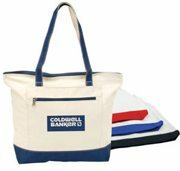 Large compartment with an interior pouch, all zippered. 12 Oz. cotton canvas. Zippered main compartment and front pocket. 2-tone hand/shoulder straps. Colors : Natural with trim in navy, red, royal, black. 600D polyester. Zippered main compartment with interior zippered pouch. Large front pocket with Velcro closure. Made of 12 oz canvas. Hand & shoulder strap.